Kimchi Chronicles has hit PBS (Public TV stations) nationwide, and we hope you’re loving the series so far. 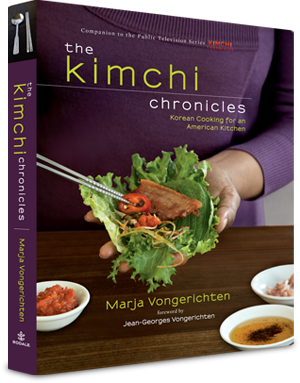 Now, you can enjoy the recipes featured in the show and many more from the companion book to the series, “The Kimchi Chronicles: Korean Cooking for an American Kitchen”. From Jean-George’s exquisite recipe for ginger fried rice to Marja’s favorite jajangmyeon (noodles with black bean sauce), there are plenty of delicious eats featured. Stay tuned for exciting blog updates soon to come, from recipes to exclusive behind-the-scenes sneak peeks! Keep up with us on Facebook and Twitter for even more updates.